Canadian astronaut Bob Thirsk blasted off in a Soyuz spacecraft Wednesday, beginning a record-setting six-month mission at the International Space Station. The spacecraft launched from the Baikonur Cosmodrome in Kazakhstan at about 4:34 p.m. local time with a Russian cosmonaut Roman Romanenko and Belgium's Frank De Winne also aboard. Thirsk's 81-year-old mother and his three children watched the launch from a viewpoint about 1.5 kilometres away. "It's rather exciting," said his mother, Eva. "He's doing what he wants to do. And he's so happy about it. And I'm so happy for him." 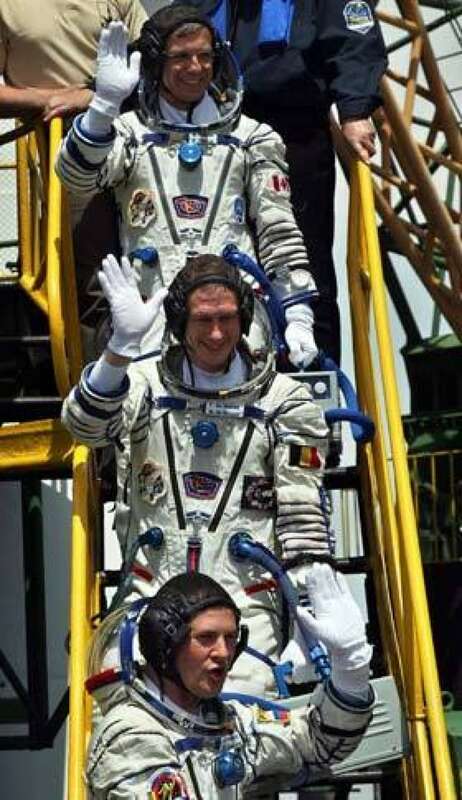 Footage from inside the Soyuz showed the three astronauts waving and giving the thumbs-up. The spacecraft quickly reached its targeted orbit of about 200 kilometres above the earth. The Soyuz TMA-15 capsule will soar through space for about two days before hooking up with the orbiting station. The three will double the size of the crew at the giant space laboratory, with the six the biggest crew to ever work on the space station. Russian Gennady Padalka, U.S. astronaut Michael Barratt and Japan's Koichi Wakata are already at the space station. It will also be the first time all five international space agencies — NASA, Russia's Roskosmos, Japan's JAXA, the European Space Agency and the Canadian Space Agency — are represented at the station simultaneously. Thirsk told a pre-launch press conference that mission management teams have tried to anticipate any problems arising from the bigger crew, but added it will only be after the astronauts have been living on board for one or two months that they'll be able to identify any additional issues. "Living aboard a space station is not like living in a four-star hotel," Thirsk told CBC News in a February 2008 interview before being sequestered by NASA in preparation for his mission. NASA says that in the future, the space station could take as many as 13 people, as the crew hosts short-term visitors. Thirsk, 55, is the first Canadian to go to space aboard a Russian spacecraft. Canadian astronauts usually blast through the atmosphere via American space shuttles. In addition to performing scientific experiments on the space station, the British Columbian, who was born in New Westminster, will serve as the crew's medical officer and robotics specialist. Canadian astronaut Robert Thirsk, top, Russian cosmonaut Roman Romanenko, bottom, and European Space Agency astronaut Frank De Winne of Belgium, center, board the Soyuz-FG rocket at the Baikonur Cosmodrome, Kazakhstan, on Wednesday. ((Anatoly Maltsev, pool/Associated Press))It is Thirsk's second mission in space. He made his first 16-day space flight aboard the U.S. space shuttle Columbia in 1996. In one robotics experiment, he'll control a small, wheeled rover from the station. The rover, nicknamed Red, will ride around a dusty back lot near the Canadian Space Agency's headquarters in Montreal. A rover on Mars could be controlled from the space station in a similar way. The six months he will spend on the space station will also be a record stay for a Canadian. A major goal of the mission, dubbed Expedition 20/21 by NASA, is to test the endurance of the human body in space. Scientists hope to use the information to one day build space colonies on the moon and Mars. During Thirsk's stay, Canadian astronaut Julie Payette will also visit the space station during her own 16-day mission on the space shuttle Endeavour that begins June 13. Three different space shuttles are scheduled to visit the station during Thirsk's mission, as well as three cargo vehicles — two from Russia and one from Japan. The International Space Station is in the final stages of an 11-year construction project. Fifteen nations are partners in the orbiting laboratory. YOUR VIEW: Would you be able to handle six months at the International Space Station?